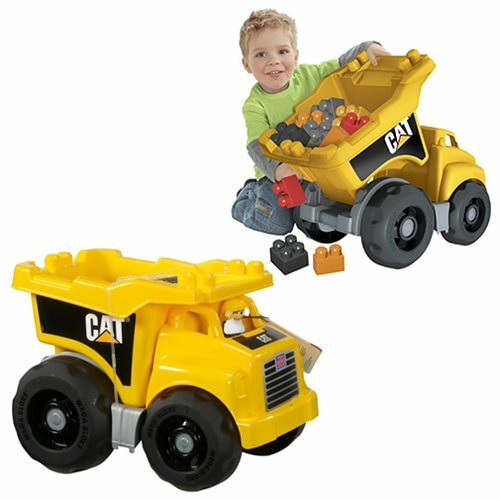 Have your little truck driver get behind the wheel of the CAT Dump Truck by Mega Bloks! Your child can haul all sorts of loads by pushing the truck around. The CAT Dump Truck has a huge rear bin that tilts back and dumps out its contents with ease! Ideal for children ages 1 to 5. The Mega Bloks CAT Dump Truck includes 1 construction worker figurine, 25 blocks, and construction site pieces to build an authentic construction zone! Mega Bloks CAT Dump Truck includes 25 pieces. Measures approximately 16 1/2-inches long, 12 1/2-inches tall and 12-inches wide. Ages 1-5.